Sri Lanka’s 2-0 series win over New Zealand now means that, if things don’t work out for South Africa against South Africa B England this winter, Kumar Sangakkara’s side could potentially end the year as the world’s top-ranked team if they win the series in India. If India were to win the series 2-0, then they would take the top spot. India’s home record against Sri Lanka is impressive, with the tourists never having won a Test, but the side which is likely to tour will be very strong indeed. The emergence of Rangana Herath as a genuine spin threat in the series against the Black Caps means that there’s less dependence on Murali to constantly take wickets (which is handy, given Ajantha Mendis’ struggles), whilst the batting order has looked assured. Thilan Samaraweera in particular has been making centuries with impressive regularity of late, and Dilshan’s elevation to opener seems to be a smart move. Could Sri Lanka be the world’s best? On their day, quite possibly. After making his Victoria debut at the ripe old age of 29, going missing in Middlesex and briefly going Dutch, Dirk Nannes is set to establish himself as a key part of Australia’s One Day attack. 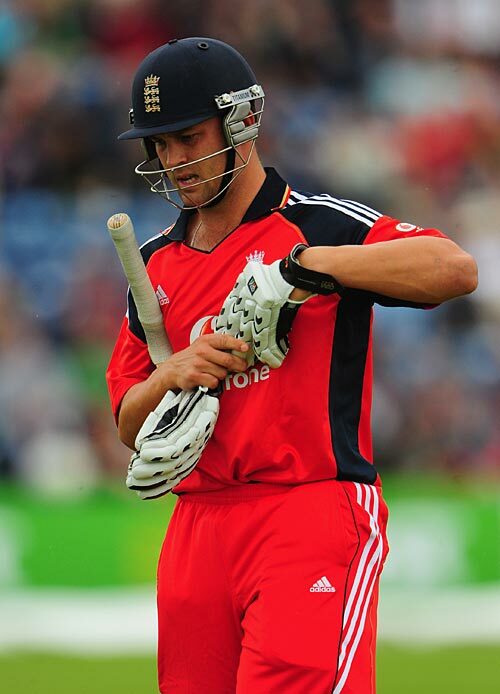 Having made his ODI debut yesterday in Australia’s demolition of Scotland, ‘Dirty’ Dirk will be looking to make an impact in the two Twenty20 matches against England in Manchester, and he certainly has the pedigree to do so given his success in the Twenty20 Cup with Middlesex and in the IPL with Delhi. Of course, I’m hoping he’s on the losing side on Sunday (assuming the fabled Manchester climate allows enough play for a result ), but seeing him in the flesh will be special. With almost two full years to go until the 2011 World Cup, qualification for the 2015 competition is already well underway, with the World Cricket League (sadly, unlike the World Soccer League, not featuring the Timborary Shamrocks) having reached the Division 6 stage in Singapore. Bahrain, Botswana, Malaysia, Guernsey, Norway and Singapore will all be competing for the two places available in Division 5, to be held in Nepal in early 2010. Bahrain have already had to qualify for this stage, winning Division 7 back in May, due in no small part to the wickets taken (and the half-century scored in the final) by Qamar Saeed. As well as Saeed, Adil Hanif (the second-highest run-scorer in Division 7) will be key. Confidence will be high, but Bahrain have never faced most of the other sides in the competition, so it’s hard to say what reasonable expectations would be. Botswana have prepared for the tournament with a training camp in Sri Lanka, and are apparently the fifth-best non-Test team in Africa, but that’s the sum of my knowledge of the game in Botswana, I’m afraid. Guernsey, like Bahrain, qualified from Division 7, having been associate members of the ICC for less than a year at the time. Having enjoyed home advantage back in May, things will be harder this time around, but if Jeremy Frith can find form with the bat, then progression is possible. Malaysia beat Singapore earlier this month in the Stan Nagaiah Trophy, which they will hope proves to be a good omen. The Malaysian side will be hoping that conditions will be in their favour, and that the likes of Thushara Kodikara and Suresh Navarathnam can inspire them to victory. Norway dropped down to this level after finishing 9th in Division 5 last year, and will be hoping to bounce straight back with a strong showing this time around. Most of their players are of subcontinental origin, with the majority of Pakistani descent, but there are few if any names amongst their squad that mean anything to me. England beat Ireland by a mere 2 runs in a rain-shortened thrller in Belfast, having posted a mere 203/9 from their 50 overs. Oddly enough, Owais Shah saved the day by taking a best-ever 3 for 16 after Trent Johnson had embarrassed England’s batsmen, claiming four wickets (including Trott and Bopara for ducks). Australia will be hoping for better luck when they take on Scotland tomorrow in their own warm-up match, although it’s hard to see Scotland putting up the sort of fight that Ireland did – the latter beat the former convincingly last weekend. What’s Next for Test Cricket? Now that Australia have slumped to fourth in the ICC rankings, what does the future hold for Test cricket? Far removed in many ways from the drama of the world’s most famous Test series, some extraordinary cricket has been taking place in Amstelveen. Twenty wickets fell on the first day of the Intercontinental Cup match between the Netherlands and Afghanistan, the Dutch managing to make 181 whilst the tourists made just 107 in reply. Hamid Hassan and Mohammed Nabi took four wickets each for the Afghans (the latter for only 45 runs in a ball less than 18 overs), but their batsmen were soon 10/4 in reply on the sort of pitch that would have the average county Chief Executive waking up in cold sweats. Tom de Grooth bucked the trend by making 54, which is probably worth about 200-odd on the sort of wicket Tests are usually played on these days.